Key Difference: Dissolution is the process through which a solute gets dissolved into a solvent and forms a solution. 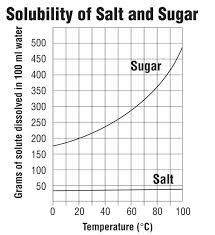 Solubility is a quantitative term defining the maximum amount of solute which gets dissolved into the solvent. Dissolution and solubility are related to each other, still there is a subtle difference between them. Dissolution refers to the process when solute dissolves in solvent and forms a solution. Solute refers to the solid part, whereas, solvent refers to the liquid part. There are many attributes which influence this type of reaction like size of solute, temperature and properties of solvent. In case, solvent is removed from the solution by employing techniques like evaporation, then clearly solute can be found distinct from the remaining solution. This process of separation is also known as precipitation of a solid or the evolution of a gas. Thus, precipitation is also considered to be an opposite phenomenon of dissolution. Together, they constitute in developing a dynamic equilibrium. Therefore, solubility is totally a quantitative terms. Usually, if 0.1 gram of solute is able to dissolve in 100 mL solvent, the substance is considered to be soluble. In case less than 0.1 gram is only able to dissolve in 100 mL solvent, substance is known as insoluble or sparingly soluble. Thus, solubility and dissolution are closely related. Solubility just quantifies the process of dissolution.